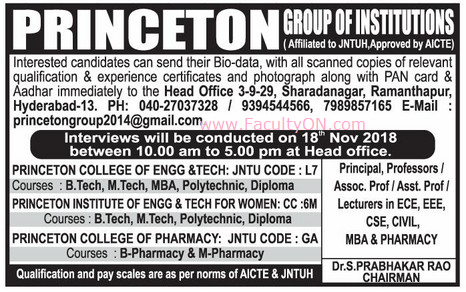 Princeton Group of Institutions, Hyderabad has advertised for the recruitment of Teaching Faculty- Professor / Associate Professor / Assistant Professor / Lecturers jobs vacancies. Interested and eligible job aspirants are requested to walk-in on 18th November 2018. Check out further more details below. About College: Princeton college of Engineering technology sponsored by Vagdevi educational society are Affiliated to JNTUH University, approved by AICTE. We have well constructed buildings & infrastructure. These colleges are located in heart of the cityOur colleges are well connected by the APSRTC buses from different parts of the city. We have excellent, experienced and committed faculty members, well furnished classrooms, sufficient equipped computer labs and a good Library having national & international journals and E-Journals provided by DELNET. Salary Package: As per AICTE / JNTUH norms. How to Apply: Interested and eligible candidates are requested to send application along with CV, copies of certificates, PAN card, Aadhaar card, JNTUH faculty registration and recent passport size photo to the head office address given below.